As I hinted in my last pedal-chain overview - while 2018 was very evidently ’The Year of Fuzz’ for me - which still has some slight residuals into 2019, this year is going to be largely about ’Glitch’ for me - as the pedal-chain has now matured nicely to contain several excellent options and alternatives in pretty much every slot. To accommodate my burgeoning collection of pedals - I am having to rotate more - and to give each pedal a fair turn on the carousel. Generally the pedal-chain is well-behaved, but I get the odd day now and then when things don’t sound quite right - and there are possibly some oddities in the general electricity supply to the house / wall-socket. Possibly I need some sort of electricity conditioner at some stage - while these things really don’t happen so often. When changing around quite a lot of pedals - I find the new glitch pedals tend to have some sort of buffer - which has impacted on the tone and compression / clipping of the signal - so I’ve had to fine-tune and tweak large parts of the chain to make those accommodations. It’s quite evident why I’m mostly sticking to one guitar nowadays - as it would be quite the task to have to tweak the entire 40 pedal chain every time I changed an instrument - even though I have several EQ pedals throughout the chain - possibly I need one near the start of the chain - with presets - which can set the right core signal tone for each guitar I choose to use - for now - I will just rely on my still fantastic PRS CE24 - which mostly delivers everything I need - I would still like to add a 513 though at some stage! In any case - I’ve indicated pedals to be added in green outlines, and have featured a couple of alternative arrangements this time - one featuring my ThorpyFX pedals, and another accommodating two new (to me) pedals from Canadian firm Aleks K Production. I am very pleased to have completed the 'Thorpy Trifecta' of Fallout Cloud Fuzz, Gunshot Overdrive and Warthog Distortion. But realise now that it should really be a 'Thorpy Quadfecta' and needs the Peacekeeper low gain overdrive in the mix too. It took me a while to swap around my existing larger format V1 Fallout Cloud for the new mini version - but I am now the proud owner of the trifecta wholly in Mini / V2 editions. The above visual indicates exactly where the Thorpy pedals go and how they are accommodated within the chain when I rotate them in - they do all of course sound universally excellent - really dynamic and vibrant - as is Thorpy's way. I have had my eye on a pair of Aleks K pedals for a while - the Maple Leaf Royal Drive as famously used by Devin Townsend and featured not to long ago on That Pedal Show, as well as the newer V2 version of the Red Scorpion High Gain Distortion - which I have featured a couple of times on this site. Both pedals have that fantastic kind of dynamic sizzle to them that I really like and both have excellent tone/EQ controls which give you all the variety you need within their respective categories. 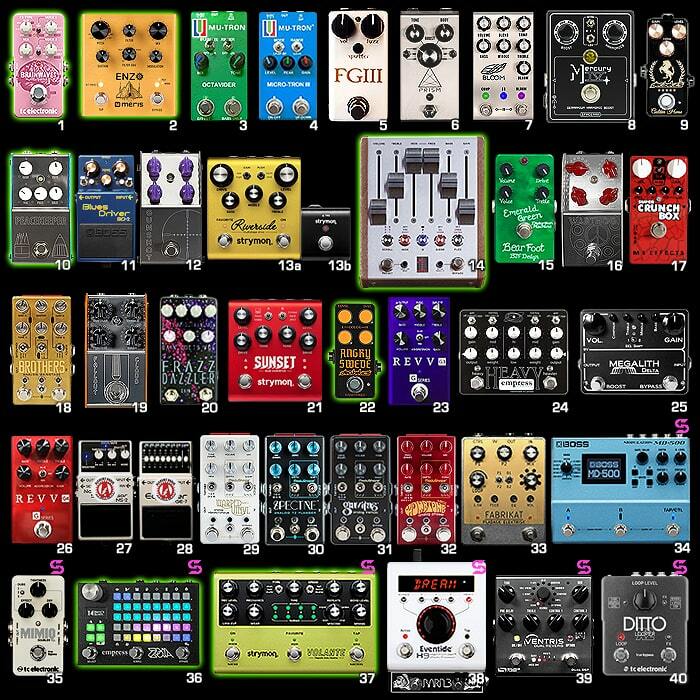 I came across these first courtesy of Brett Kingman, whom I follow avidly - and whose pedal demos are universally excellent and right up their with Andy Martin and Mike Hermans as the best of this kind. Aleks K is rather little known in Europe and does not appear to have much of a distribution network currently - so I will do my best to spread the word through these Eurasian United States! I've been using the TCE Quintessence Harmonizer on this slot for a while now - and however good it is - and it is good, it's always a touch tricky to set up - and you almost need to be a music theory genius to get the most out of it. So the forthcoming Brainwaves Pitch Shifter gives you a lot of the same stuff but in a much more accessible way. You have two Voices which you can set up or down in all the typical intervals - with Custom settings available too, and you have 7 modes / Presets - Pitch, V1>V2, Wham, Detune and 3 TonePrint options. I see this as a sort of DigiTech Whammy / EHX Pitchfork hybrid with bells on - and it should allow me to do a lot more with the one pedal here - hopefully sub for the DigiTech Whammy Ricochet too. I've still to get a DigiTech FreqOut - it's really not a priority, but I think I may go for the Keyztone ExChanger this year at some stage. The Brainwaves is pretty much a cert, the ExChanger is a likely, while the FreqOut is really just an optional extra 'nice to have'! While I got on really well with DigiTech's Dirty Robot, I did not gel as well with Pigtronix's more feature-rich Mothership. I've been deliberating on this point for a long time, and think I might just spring for a Meris Enzo at some stage - it does lots of things I like, and several of my industry colleagues seem to get on very well with it so I will likely take a gamble a little later in the year. I also like the look of Subdecay's Octave Theory Modulator/Synth which came out at the tail end of last year. That one's another 'nice to have' which will likely be over-ridden by all kinds of other priorities this year. I still really like the Octavider even though some don't seem to get along so well with it. I've also been keeping my eyes peeled for a Modified Dual Settings EHX Nano-POD - of the type Rick Matthews used to mod - if I don't get my hands on one of those for a while, I may go for Rick's own label interpretation - The Chemist Atomic Modulator V2. I understand both those devices can have some tracking issues - so whichever way I go it's a slight gamble. This is another pedal I really love - I kind of gave up on using a regular Wah - slightly too fiddly and cumbersome - and went with this Envelope Filter / Auto-Was instead, and it sounds fantastic. I have no problems with this at all. There are a couple of new Filter style pedals on the market recently and both featured at NAMM 2019 - Pigtronix's Resotron Tracking Filter, and Shift Line's A+ Prism-9 Filter Pad Pedal. I'm not looking to shift or replace the Micro-Tron III - but one of those others may end up on rotation here - but it's a fairly slim probability within all the other priorities. I have 5 Slots on my pedal-chain which see a lot of pedal rotation in particular, and 2 of the fuzz slots share around 70 pedals! - the CBA Brothers and Dr Scientist Frazz Dazzler are pretty much permanent fixtures in their own respective slots (#18 & #20). This Slot #05 contains all the more sensitive and typically Germanium Fuzzes - and I've listed the current occupant and 12 of those most regularly used in rotation here. I did my 'Year of Fuzz' last year - and I'm very much within the tail end of that process now - although there are still a few I'd like to add at some stage. As per this post really - I actually very recently put in an order for a Mojo Gear Mojo Fuzz Deluxe NKT275 - but the one that remains top of the wishlist for this slot really is a Spaceman Gemini III Dual Fuzz Blender - which allows you to manually blend Germanium and Silicon Transistor Fuzz circuits - I really want something of that ilk - the original though keeps going up in price and is well beyond the £1,000 mark currently on the second hand market - so I would need an alternative there or a lottery win! I've loved this triple option boost (Clean/PreAmp/Treble) since I first got it. It would be cool to see a V2 of this closer its sibling Bloom pedal - i.e. with full 3-band EQ and presets - so you can flip between the 3 boost voicings without having to change all the controls each time. I'm really not looking to switch this out as it serves me really well - but on a similar tip we have the Chase Bliss Audio Condor and the ThorpyFX Team Medic - the Condor does not have a buffer - so for my long pedal-chain that serves me less well - so I've also mentioned it as a possible rotation alternative for the Brothers pedal on slot #18 - not for the Fuzz and Drive tones, but more as a mid-chain EQ and Boost pedal - for spicing things up. I've had this one for a good couple of months now, and I'm near enough completely acclimatised already! The way the Presets work is ingenious - and alongside the EQ and Blooming Boost - this is truly a marvellously useful utility pedal - I just wonder if it would not be better to have a couple more tweakable controls over some of the finer nuances of the Compressor. As it is it totally serves my purposes - and I find myself using all 3 different functions all the time, alongside most of the Compressor Preset Modes. This is definitely the right sort of pedal for me. If I had not gone for this one - I would likely have sprung for the DryBell Unit67 - which does a lot of the same things but in a more traditional fashion. I was chasing a Mercury III for the longest time - but those prices were just silly high, and when the Mercury IV first arrived I dismissed it because of its larger medium enclosure form-factor. It is however just as good sounding as the Mercury III and does much the same thing - to such a degree that it's become a pretty permanent fixture in the chain - it adds sparkle to just about every drive and fuzz pedal up and down the chain. This slot was previously used sort of for Tube Screamer type pedals and there are several of those on rotation here - but very rarely. I really like the look of the new Ibanez/Vemuram TSV808 collaboration - but I'm unlikely to swing for it at its opening gambit price of $450/£435. Ibanez really should have done a Boss JB-2 style exercise on this and made it more affordable - I'm hoping they make lots, sell only a few and the prices have to come down! On this slot I went from a Mini Klone (Tumnus) up to Maxi Klone (Tumnus Deluxe) and back down to another Mini Klone - in the form of the fantastic Guillem Vilademunt designed Decibelics Golden Horse - which I just really love - there's something about its timbre and how it's tuned - and a fantastic wide-ranging single tone control - that makes this my perfect Klon-style pedal - I encourage everyone to try one - these are beautifully made and the internals are a masterpiece of miniaturisation - the insides look as fantastic as it sounds. I still have a mind to get a Magnetic Effects Sändare V2 at some stage and possible a VFE Merman - if I can find one in the correct enclosure configuration, and at the appropriate condition and price. I foolishly proclaimed the Pantheon the be-all and end-all of Bluesbreakers - before I got properly to grips with my JHS 4-Star Modded Analog.Man King of Tone. Both those pedals are magnificent actually and have a sufficiently different voicing / tonal profile to justify having and deploying both - each is the champion at their particular enclosure size - although I would say you should also try out the most recent version of the Snouse BlackBox 2 - the Stage Pro Mod edition with the 4 external toggle-switches, I have a slightly earlier model with 3 toggles. This slot covers Bluesbreaker and Harmonic style overdrives - and I'm still intending to round-off my Harmonic Overdrive trio with the Greer Southland at some stage. For now though I don't see much shifting the Pantheon from pride of place in this slot. If something does, it might just be the ThorpyFX Peacekeeper - which I have now deemed the fourth corner of Thorpy's Quadfecta - up from the previous Trifecta of Fallout Cloud, Gunshot and Warthog which I have all now in their neater V2 Mini enclosure size - so just one more to go again for the full set! I really love the sound of the Blues Driver right along its saturation/gain curve - and particularly in its Keeley Phat Mod edition - which I was first introduced to courtesy of the diminutive Mooer Blues Mood clone. Although I occasional switch in the Boss JB-2 Angry Driver on this slot, it is almost solely dedicated to a rare Keeley Modded version - the 'Freak Fuzz Mod' which contains both the dual Germanium Transistor sort of fuzz stage and the re-EQ'd bassier Phat Mod which I love so much. This is for sure one of my perennial favourite drive pedals and pretty unassailable in its slot. Note that demo video for more common 'Phat Mod' version, could not find video of 'Freak Fuzz' pedal version. The Demon Pedals Kondo Shifuku is actually one of my most recent acquisitions - and as a big fan of Dumble ODS style sounds - I feel this is the best sounding and most versatile of those at this compact enclosure size. This slot is actually fairly multi-disciplinary as it features several different families of overdrive - Dumble and OCD style, Mosfet Multi-Drives, Plexi, Sunn T, Power Booster and Creamy and Searing Drives. I've long had my eye on Canadian Aleks K Production pedals - and am looking to get a Maple Leaf Royal Drive for rotation on this slot too (as used by Devin Townsend). I also have my eye on a couple of pedals that were released in and around this Winter's NAMM show. After being slightly non-plussed when I first got this, this has become one of my essential pedals. I essentially use it for two different tones - with the Favorite setting set to a creamy 80's style distortion, and the stock settings used as an upstream and downstream boost and signal enhancer. I now find his pedal extremely versatile and it pretty much owns its slot - nor is there anything else particularly comparable as far as I'm concerned to be worth rotating it. I often have several different pedals with secondary boost switches in the chain - and I find that the boost voicings are each quite distinct in character and can be stacked in various ways for more variety. This is another slot which has pretty much a permanent resident in the guise of the Emerald Green Distortion Machine - which is set to a sort of Top / Treble-Boosted Driven Vox tone. It actually has a voicing dial which allows you to shift profile between sort of Plexi and Vox styles - and it's my 'Brian May' pedal of choice currently - although I have been eyeing up the rather rare ThunderTomate / Massive Unity TAE PreAmp too - but there really don't seem to be any of those currently available. There's a few pedals here for fairly rare rotation, and a few more on the possible horizon for acquisition - but I'm pretty much sticking with this one for now - it's another one of my perennial favourites. This is a slot that's been seeing a little more rotation of late - the Dr Scientist The Elements has typically been the first choice here, but there are few pedals now that warrant fairly regular rotation on the slot - including Sheldon Ens' True North Tweed Drive and Thorpy's Warthog. I also intend to get the Aleks K Red Scorpion V2 for rotation both on this slot and #23. The Wampler Sovereign still retains its place on the wishlist - while I'm hoping for a more compact Expandora + Boost pedal some day from JHS - courtesy of a V3 pedal of that type which brings back some of the V1 features into the more compact form factor! Even after I have the Automatone I will still retain this really useful and versatile pedal. I use it pretty much all the time as a Fuzz Type pedal - usually combining at least one or both of the fuzz voicings. There really is no equivalent or alternative pedal for this slot - although I might still get the CBA Condor one day - to mix and spice things up a little on occasion - but for a completely different purpose - more of a mid-chain EQ / Filter / Boost! rotation on the two main Fuzz slots - #5 and this #19. I currently have a large number of Basic Audio, Hudson Electronic, Magnetic Effects, Skreddy Pedals and Spaceman Effects fuzzes - and it's getting difficult to accommodate so many varieties - but I do rotate things fairly regularly to give each pedal a go. There are periods where one or two might dominate for a while - and then be rested for an equally long time to give the others a chance. Pretty incredibly I get fairly distinct and very usable tones out of all of those different pedals. Top of my list to get is the forthcoming Beetronics Swam - while the recently released Wren and Cuff De La Riva dip-switch central Muff fuzz is also highly intriguing. I keep thinking / hoping that my fuzz obsession is coming to a close - and while it's slowed down somewhat - there's still some rounding off to complete! This is another of my almost unassailable pedals - I think this and the CBA Brothers are generally the ones with the least movement. This is the sort of dedicated Rat / Fuzzstortion slot - although some fuzzstortions also get a rotation on #19. I'm still interested in getting my hands on a 1981 DRV even though slightly overpriced for what it is, and I'm also keen on the rather more oddball Mid-Fi Clari(not) and Anarchy Audio Deadwoods. This is yet another great Strymon pedal - for those that are into that sort of thing. You can run this pretty heavy - which is what I do most of the time. I usually have one side (Left) as a boost so I can apply that independently to the chain too - as a proper Treble Booster. This is such a highly versatile and effective pedal, and there's no proper alternatives to it really - while I am also interested in the Keeley D&M Drive and 6 Degrees FX Amplitude Eleven PreAmp for sometime rotation - but those are not at all priorities at the moment. Right now the Alchemy Modded Xotic SL Drive is still pride of place, but I hope to rotate in Guillem Vilademunt's new Angry Swede pedal as soon as it's made available to me - hopefully sometime in February! I also really want to get a OneControl Jubilee Red AIAB for this slot rotation - but they seem in very short supply right at the moment - so will keep a look our for more of those coming into distribution. This slot has had quite a lot of competition of late - and I have been getting great tones out of all the pedals I have on rotation - most recently the Abasi Pathos and Lone Wolf Audio F.O.A.D. - however right now I'm leaning towards the REVV G3 for its particular mid-pushed and right modern flavour of high gain distortion. Right now I have plenty of options on this slot and am not feeling the need to add any more currently. I actually really love both my Empress MultiDrive pedals - both of which are capable of some High Gain Saturation - but obviously the 'Heavy' was engineered exactly for that task. Still probably the most versatile and flexible of all the 'Metal' pedals and you can get a variety of fantastic and distinct voices across the two channels. I've been on the verge of springing for a Bogner Ecstacy Red for rotation here - which is currently ahead of the Throttle Box EQ on the priority list. A lot of players don't like the Throttle Box and struggle to get decent tones - as with a lot of the more complex MESA/Boogie amps - it does require patience and due diligence when dialling in - and if you get it wrong it can sound hollow and synthetic. The Megalith Delta started as an understudy to the Empress Heavy, but I liked it so much I gave it its own slot. It's a super flexible metal style pedal with lots of bottom end - although I find the boost switch somewhat too overly subtle for my taste! In any case I love this pedal and don't really intend to oust it any time soon - while I do have an eye on the new Horizon Devices Apex PreAmp for sometime rotation at some stage in the fairly distant future. REVV are really killing it on the High Gain pedal front at the moment and this is the second half of my dynamic duo really. For the longest time the rather larger Diezel VH4-2 was pride of place in this slot - but I've decided that the G4 gets close enough to it and offers plenty more variety besides in a far better form factor. The Wampler Triple Wreck was also on heavy rotation recently, while the Keeley Modded Metal Zone gets a look in every now and again. There are a few more pedals I would like to get for alternative rotation on this slot - with probably the XIX Tech HMD-1 HM-2 Clone the top of that list - it's currently sold out, but hopefully there will be more stock soon on Reverb.com. This is still my Noise Gate of choice - I've tried a few now but keep coming back to this one - it seems to serve me the best. I have considered trialling the TC Electronic Sentry too - but there's really no need right now and it's not a priority. Same goes for the modded GE-7 - which I still love and still continues to serve my faithfully - even though there are elements to it that could be improved. Apart from the somewhat clunky to use Source Audio EQ with Presets no one has done much innovation in this area recently for this form-factor. There are lots of more automated larger EQ pedals - but I really need it to be compact and have sliders for immediate and obvious visual cues. I have toyed with getting a Parametric EQ here - and the choices in the compact form factor are either Brian Wampler's recent EQuator or the pretty nifty WMD Utility Parametric EQ - in any case I've not made my mind up properly on either of those and happy to stick with the GE-7 for now. You often don't know how much you will miss something until it is gone - and after my 2 week experiment with Zvex's Vibrophase on the Wombtone slot - I kind of came to the conclusion that the Chase Bliss Audio pedals are still my favourites for these analog modulation slots - and will remain the primaries in each case. That said I still like the sound of the Boss DC-2w and will likely add that to the chain at some stage on temporary rotation - both in this Warped Vinyl slot, as well as at the start of the stereo effects - in its stereo mode. There's no particular urgency on this as I really like the Warped Vinyl still - and will continue to favour that. I had toyed with and was actually on the point of hitting the purchase button on an EQD Pyramids Stereo Flanger - when I decided that I would rather not be without this so frequently overlooked gem. I have some great alternatives for rotation, but the Spectre very much holds its own and is in pretty much constant daily use. The Spectre does near enough everything I need it to, and it has active deputies in the guise of the Boss MD-500 and Eventide H9 which are a little further down the chain - and both do a variety of great sounding stereo flangers too! So after having come so close to my first EQD pedal, I'm still one step away. I was also considering the EQD Data Corrupter - but have decided that I prefer the form factor of the Beetronics Swarm to that. This is often the case with pedals - which of course have to be a mix of form and function. The Gravitas is still my favourite Tremolo and probably slightly unfairly monopolises this slot ahead of the almost equally brilliant Stone Deaf Tremotron. I have had the Strymon Flint on the wishlist for the longest time - while both the Mastro Valvola LFO and Red Mountain Tremolo have their own strengths, but I love my existing tremolos and adding new flavours here is not a priority. This is the slot that taught me a lesson about missing something when it's gone. I had the Zvex Virophase on rotation here for a couple of weeks or so recently, and although it is very good on the clean side of things - it really does not do half of the things I have become so reliant on the Wombtone for. In this one exercise I realised how much I truly still loved my Chase Bliss Audio pedals - on a functional, versatility and tonal level - apart from their general lack of stereo outputs, and a cleverer way of scrolling through presets I don't think you could do much to improve the form factor - while I feel the days of the toggle switches are numbered in line with what we've seen on the forthcoming Automoatone. Those kind of push-buttons are typically a lot less frail than sticky-outy toggle switches - two of my JHS modded EHX Muff Fuzzes were damaged in transit and had to be replaced - that's partly down to poor packaging, as well as the fragility of those mechanics. Chase Bliss Audio are definitely leading the way for modern pedal design. This is the biggest change to the pedal-chain of late - as 'Glitch' pedals get their own dedicated slot - variously Granular Delays, Micro-Sample-Loopers, and various Granular Modulators and Pitch Shifters for a variety of blippy / trippy / glitchy / stuttery soundscapes. I've gotten off to a bumper start with four of the best in this area - and the Fabrikat V2 and Molecular Disruptor V3 obviously require a lot of patience and due diligence to dial in - the way forward in that area is definitely what Cooper FX is doing - with the help of an LED Display Screen - after all these are mostly digital effects with myriad permutations - so a digital visual interface (screen) is probably the best way to control those - with presets etc. There's quite a few effects on the wishlist, and I will likely get a fairly small subset of those - with the MWFX Judder and Red Panda Particle V2 the most likely next acquisitions. I'm also pretty interested in the Cooper FX Moment Machine. Before the Automatone and Strymon Volante were announced I was all primed to get a Line 6 HX Stomp to become my Modulation Workstation of choice. With several other high ticket acquisitions planned - one has to be sensible really - and the HX Stomp gets put on the back burner. Just as well really as I'm forever 'discovering' overlooked modes and presets on the MD-500 that I'm really loving. So the MD-500 will maintain its position here likely into next year. This pedal was initially the last one in the chain, but on occasion had a detrimental impact on panning effects - in particular ping-pong style delays - so I moved it in front of the delays! Other than that this pedal is still fairy dust for stereo rigs as far as I'm concerned - giving you extra width, depth and sparkle onto your core tone! We're still waiting patiently for this to be released - we kind of sort of know how some of it works, but have not seen enough really in terms of as a sequential Guitar Effects Processor - most of the demos have been with synths to date, or consisted of component synths built up within the pedal. I'm still intrigued by this - but it's probably got quite a few more months of trials and finessing before it's properly ready for release. At least we know the price point on this one ($£499)! I'm still very much in love with both my Empress EchoSystem and Strymon TimeLine, but I've always wanted a Stereo Echorec Style delay - and Strymon have kicked it out the park with the overall interface / function / product design on this. It does everything you would want and in such a brilliantly intuitive way. The delays I tend use the most are Panning / Ping-Pong delay and Tape Delays - so this really is perfect for me. I still have the Eventide H9 downstream on the chain for further delays as required. I would also quite like a Boss DD-500 to complete that trio and deliver the beautiful swirly Tera Echo effect in particular which I have always loved. The DD-500 shared the ability of its siblings to combine two algorithms in series or parallel or left/right split. Apart from the clunky onboard pedal interface - the Bluetooth app is actually brilliant, and once you install a Barn3 OX9 enclosure you get a fantastically useful multi-effects workstation - which I use for a variety of things - including delays, pitch-shifting and Leslie-effect currently - since I removed the Tech 21 NYC Roto Choir from the chain and gave its slot over to 'Glitch'. The only comparative box to this I guess is the recent Line 6 HX Stomp which I'm considering as an eventual MD-500 primary rotation replacement. I still love all my 3 Reverbs - each has its strengths, and the Ventris continues to be the primary for now. I have frequent thoughts about the GFI System Specular Tempus and Meris Mercury 7 - and can't decide really which to add first - there's slightly more to the Specular Tempus, but I really love those Spacey Bladerunner style Reverbs that the Mercury 7 churns out with ease! So I have a mono Mini Ditto as an alternative at the start of the chain - largely for tuning in new pedals. While I'm still not 100% satisfied with the Ditto X2 at the end of the chain - I love its basic functions, but feel that at that level of functionality if could be in a dual-footswitch compact enclosure, or it should onboard a wider feature set to make the most use of the larger real-estate. It certainly does the job it was intended to, but not with any particular verve or pizazz. So I am gently looking at other offerings at a vaguely similar size - such as the EHX 22500. 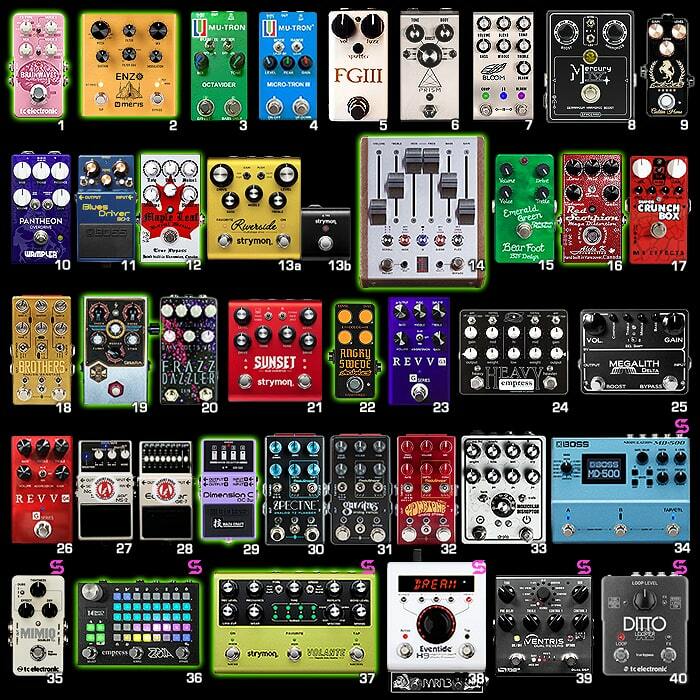 So I've listed 250+ pedal options across 40 slots - in fact 250 is also circabout the number of pedals I have in the collection - but those listed above are both existing and potential additions. The purpose of this exercise is really to outline and help reinforce my own pedal-chain options and choices. With almost every kind of decision-making process I find it helps writing things down and rationalising the reasons for and against. Obviously this listing has a very personal bias and I would not expect anyone else to go about this exercise in quite so detailed a manner - or for that manner run 40 pedals in their day-to-day pedal-chain - which is not without issues and challenges. For all you readers - hopefully my exercise brings to light new options and possibilities that you weren't aware of or had otherwise overlooked or dismissed. I always do a triple exercise in my annual pedal-chain planning - a sort of roundup of the previous year, a look ahead with what I know pre-NAMM, and a follow-up look-ahead in the immediate aftermath of NAMM - which is what this is. My intentions are always to get the most useful pedals for each of my pedal-chain slots - not necessarily just singularly great sounding, but from a design and innovations and practicality / form-factor / feature-set and versatility angle. We all have our different ways of justifying different budgets and I am very keen of establishing Quality to Features to Value - and I get annoyed in particular when pedals are unnecessarily over-priced or over-sized. There was a huge amount of innovation evident still in the pedal sector at NAMM, and we Pedal Fans really haven't had it better before - all the different choices we now have from right around the world. That said, we can become dazzled by the shock of the new and the need to keep changing - where change is not always optimal. I have come a very long way in a relatively short time, and I'm still learning and full of admiration for all my colleagues in the 'Pedal World'. Too many commentators dismiss the just another clone part of the industry - overlooking the magnificent innovation and invention that is still taking place - just look at the creativity of outfits like GameChanger Audio - who continue to explore new and interesting directions with every pedal. Robert Keeley is excited to be moving onto his new compact 224bit digital platform - first manifested in the new Eccos Stereo Tape Flange Delay Style Pedal. And I foresee more of the Dark World -like combining of otherworldly with more traditional and everyday staple effects. The 'Glitch' genre is still in its relative infancy, and we will eventually be seeing Boss and Strymon and the like making their own Glitch Workstation Pedals. There really is much to be excited about and to look forward to. Previous: The UK now has its own Pedal Rental Subscription Service ToneBuddy - how does it compare to the industry standard Pedal Genie?